Whopper's Bunker: Pissed Off Depardieu does a Oui Oui! Overrated actor Gerard Depardieu, like an a-typical frenchman decided to get one over on infamous "wanker" Neil Prendeville by urinating in the aisle while on a flight to Ireland to shoot a new Asterix movie. Obviously not a follower of the "go before you go" rule, the weak-bladdered actor apparently demanded access to the lavatory as the aircraft was preparing for take off [he had presumably never been on a plane before] but was naturally refused permission by the CityJet attendant. Edouard Baer, his Asterix co-star who was travelling with him noticed his colleague's predicament and gave Depardieu an empty mini bottle of Evian spring water for the rotund star to use as an impromptu latrine. Sadly, basic biological and physical sciences escaped both men [as did common sense and decency] and the tiny bottle soon overflowed all over the aircraft aisle as witnessed by other passengers who spoke to the media. One such passenger contacted a french radio station to express outrage over the incident. The woman said: "I was shocked. Does this mean that when you're an actor, you're not like everybody else, you don't have to abide by rules and regulations? He could have waited, but he didn't." It was reported that as the stench of urine began to fill the business class cabin, Depardieu offered to clean up as the aircraft returned to the gate. CitiJet needed two hours to clean up the actor's filthy mess. The french Directorate General for Civil Aviation said: "It is extremely rare that planes are [forced] to turn around because of a passenger." 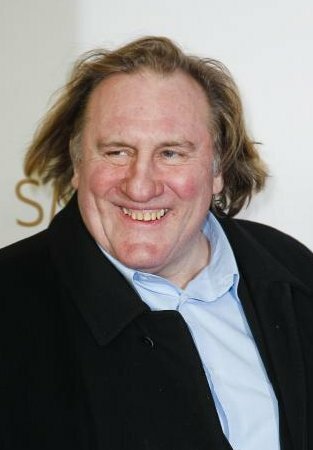 While Baer insists Depardieu was not drunk during the incident, this is seen as unlikely as it is widely reported for some years that the 62 year old actor has such a fondness for wine that he runs his own award-winning vineyard in the Medoc and boasts that he consumes as much as five bottles of wine a day like some Gallic Oliver Reed. "I’m happy with very little on this earth," he commented wryly after a serious motorcycle crash while over the legal limit in 1999, "but I do like to have a lot in my glass." I'm very surprised to see that Ireland is permitting French planes to land on its soil... I thought you'd taken care of that?